Comedy is so subjective. I think Son of Paleface is one of the great movie comedies -- if not a great movie. (I kid you not.) I laugh when I watch it people; I laugh when I see it alone. My husband thinks it markedly unfunny -- but he likes watching me watch it! Go figure. Hope is one of those comedians that you take con amore or not at all. I've always thought him to be the best when he was on his game. "Son of Paleface" is perfect for a college lecture, it's a Fellini film with a big busted woman and plenty of surreal sequences. You might want to do a follow up on the same team's "Private Navy of Sgt O'Farrell," I guarantee you comedy is not subjective in that film. Hope -- and many other comics -- seem to prosper most as the oddball element in an otherwise straight (and bland) genre film. Hope tossing off quips while surrounded by murder suspects or foreign spies is funnier than Hope doing situation comedy. Others, like Laurel and Hardy, suffer in such quasi-serious settings -- witness the Fox features, although those were evidently successful at that moment in time. Where Hope's best pictures were loaded with threatening villains, Stan and Ollie had comic foils and marginal threats (aside from the Boogie Men). And while the plots of the better Hope films could be made to work as non-comedies, Stan and Ollie's best stories are comic to the foundations. I suspect what hurts Hope now is that the genres he kidded have themselves become funny. Modern updates tend to drip with self-referential jokes, eliminating the need for Hope to step in and deflate them. Such laughs as survive tend to cluster around his egotist/coward/not-so-wise-guy character, which doesn't date, and the odd, unexpectedly relevant wisecrack. 4 bookings total, then it disappeared. The other Paramount Hope western, FANCY PANTS, had 7 bookings in my area during its initial release. I can see Tashlin and Hope's intentions for "The Private Navy of Sgt O'Farrell" and appreciate it for what they tried to do. It's a little more daring and subversive than Hope's usual 60's fare. Bob's just too damn old to play the lead. Exhibit A: The Jack Benny Charley's Aunt. I used to watch and enjoy this all the time during the 1960s-70s heyday of local station late shows. Then, like many movies of that vintage, it dropped out of sight until I saw it again at the 1999 Cinevent in Columbus. I was looking forward to seeing it again, but what a difference! That's when I learned you can watch Charley's Aunt by yourself and you'll smile and chuckle and have a very good time; but watch it with 300 others and you'll laugh till you wet your pants. I've seen this with other movies too; the original Bedazzled comes to mind. Not a scientific sampling, I admit, but there it is. 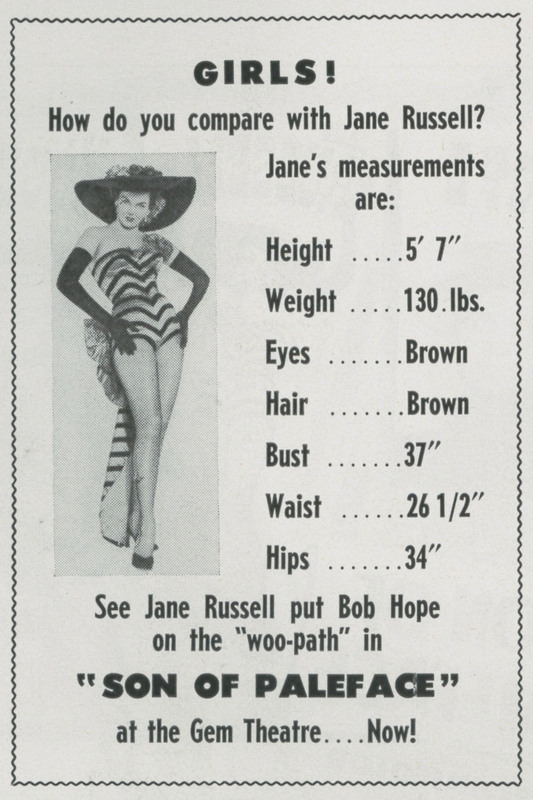 Here's a nice sidelight on Tashlin for you: A few years ago I became acquainted with a very nice older woman who was a hoity-toity "society" type. A down-to-earth Margaret Dumont you might say. She had, so she told me, been very close friends with Frank, their point of contact having nothing whatever to do with films, but antique hunting. That was Tashlin's outside passion she said. However, I could not resist asking her for some inside observations on Tashlin the director and comedy-creator. She said occasionally he would talk about a former Mack Sennett comedian who worked at Paramount that he liked and who was a help and influence. Now I was really intrigued. Who? I asked. She couldn't remember his name off-hand, but after tossing out a few possibilities, she struck on the name of Bobby Vernon, Gloria Swanson's first leading man at Sennett, later, I gather an all-purpose gagman at Paramount. RJ, that's a terrific Tashin story, and very interesting about Bobby Vernon. 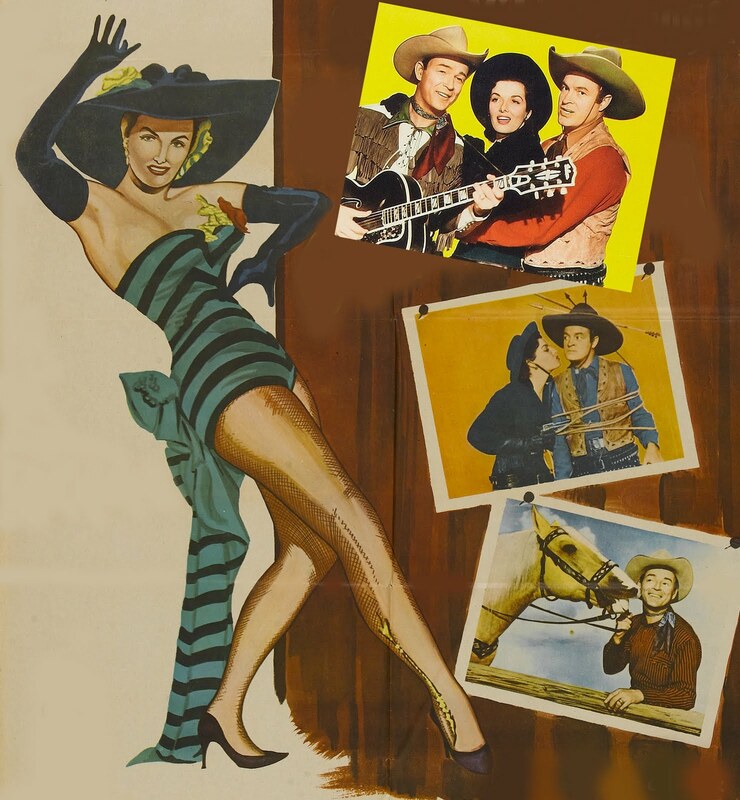 Has anyone spotted BV in Tashlin's films? Working on my book (the chapter on Son Of Paleface), I came across a news article that listed Tashlin as the writer and director of Hope's upcoming Alias Jesse James. What happened? SON OF PALEFACE! One of my favorites! It's true close examination of the one liners in even the best of Bob Hope vehicles reveals the comedian's strongest weapons were force of personality and sheer quantity of material. Half the lines are usually redundant, oddly constructed, poorly worded or just plain nonsensical. And nonsensical in a bad way. And yet these films still kill me! 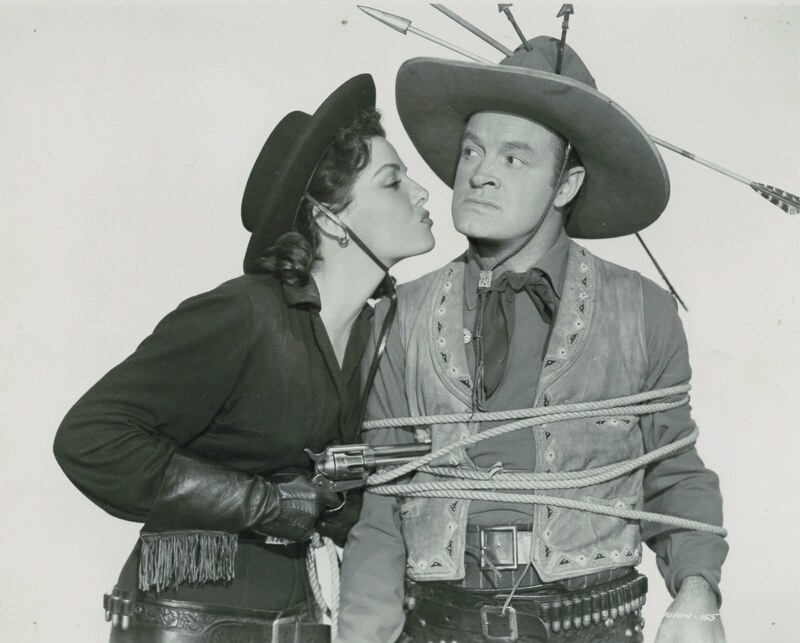 Bob Hope asking Trigger if he was born in a barn is, to me, pretty damn funny stuff. As to leading ladies, the comic's work with the talented likes of Lucille Ball and Paulette Goddard is nice, but I think he was best served when paired with dead pan glamor girls like Russel, Hedy LaMarr, Joan Caulfield and Dorothy Lamour. 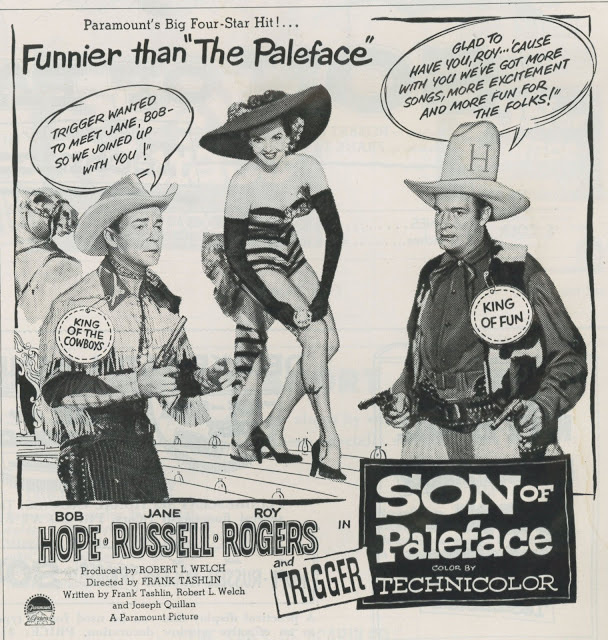 Hope never did anything successful just once so, of course, there were plenty of western follow-ups after PALEFACE. I have a special fondness for ALIAS JESSE JAMES... the special treat that two doting parents brought their surprised seven year old to on the evening of his First Holy Communion! 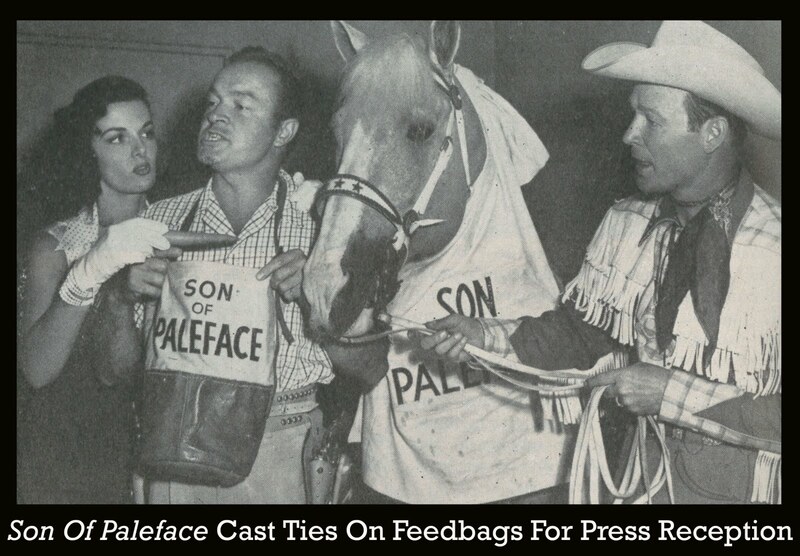 Son of Paleface, certainly one of my favorite Hopes! But I think his best work are still films like "The Cat and the Canary", "The Ghost Breakers" and "My Favorite Blonde" when he still was young and funny and his coward act had not gotten stale yet. Bobby Vernon was at Paramount (as their "comedy supervisor") beginning in 1928, and he's one of the writers for W.C. Fields' The Man on the Flying Trapeze, among others. Active mostly while Tashlin was working in animation, Vernon died of a heart attack at age 42 in June 1939, somewhere between Tashlin's 2nd and 3rd stints at Leon Schlesinger's studio. Interestingly, in the late '40's to early '50's, Paramount held the rights to a proposed Mack Sennett-Mabel Normand biopic, and in 1952 Tashlin's name was attached as a possible director, primarily on the strength of Son of Paleface. Off-topic, but Michael J. Hayde's note reminds me: That Paramount project on Normand and Sennett (The Keystone Girl) never saw completion, but it did get off the ground, at least as far as announcing Betty Hutton and Paul Douglas for the leads and hiring Hoagy Carmichael and Johnny Mercer to write the score. 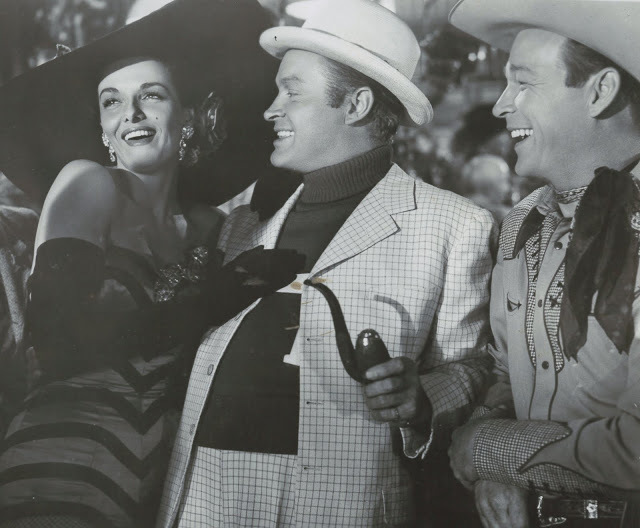 One of their songs, "In the Cool, Cool, Cool of the Evening," was salvaged by Frank Capra for Here Comes the Groom and won an Oscar; two others surfaced in other movies. But I suppose your readers know all that. What I wonder about is the other songs; were they ever published or recorded? I can't imagine that any Carmichael-Mercer song wouldn't be worth the trouble. 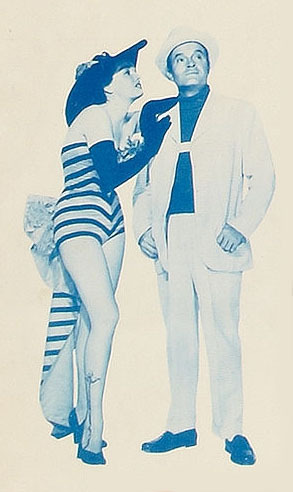 Thanks Michael for adding to the Tashlin anecdote. This was the name of "That former Sennett comedian" that seemed to strike a chord with the lady, so that was all I had to go on. Possibly before Vernon's early-death they would lunch together on the lot -- I can tell you first-hand this sort of odd-coupling would happen. I was amazed when several-years ago, meeting George Burns' longtime manager Irving Fein for the first-time, HE was amazed I was the grandson of M.K. Jerome. He said my grandfather became one of his first-friends and sort-of "protected him" when Fein was first brought out by Warners in the late thirties. This was all news to me! Thanks for the info on Vernon, however. "Man On The Flying Trapeze" is one of my all-time fav Fields and it's interesting to know that Vernon did an uncredited contribution.